A cat with a patched sack on his back and a walking stick in his hand is featured in the foreground, with a mill with a black cat standing in the doorway displayed in the background. An inscription KĀRLIS SKALBE. "KAĶĪŠA DZIRNAVAS" (KĀRLIS SKALBE. 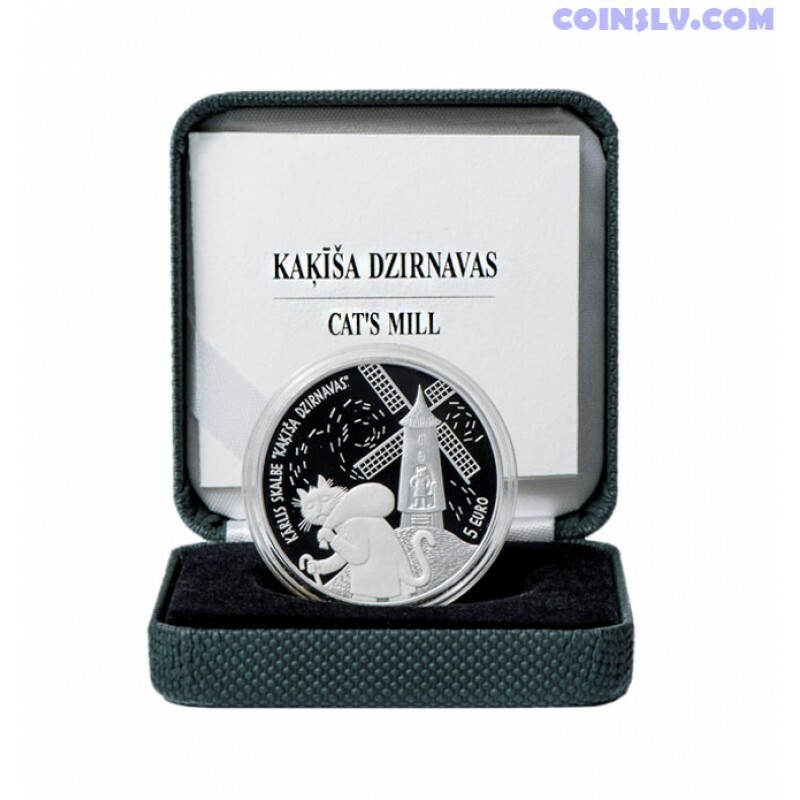 "CAT'S MILL") is featured in a semi-circle to the left, with an inscription 5 EURO arranged to the right. 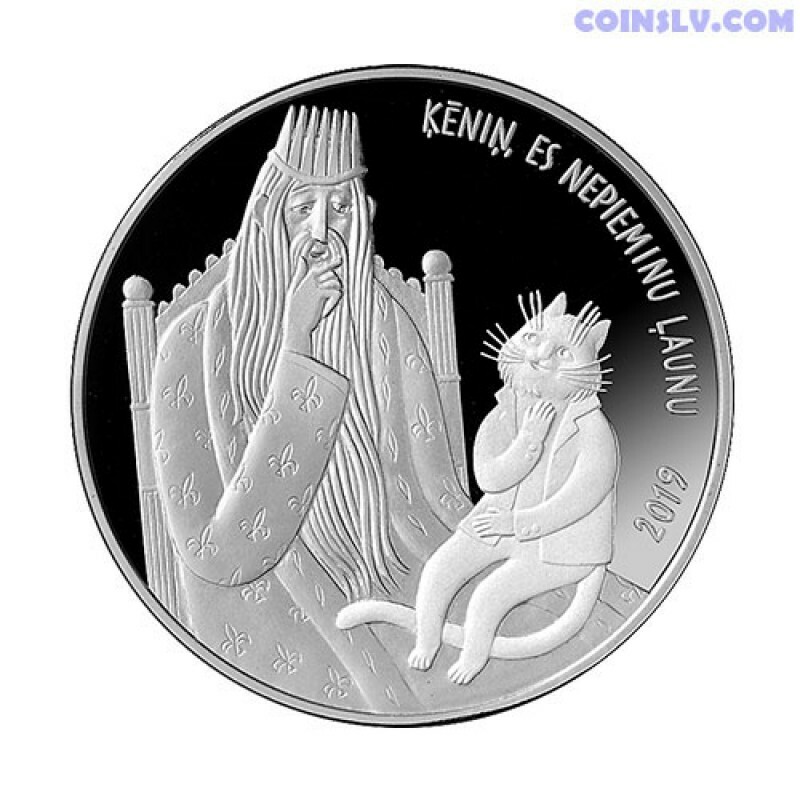 A cat sitting on the King's lap is featured in the centre, with an inscription ĶĒNIŅ, ES NEPIEMINU ĻAUNU (MY KING, I BEAR NO GRUDGE) and the year 2019 arranged in a semi-circle to the right. The fairy tale features a juxtaposition of the good and the evil. The central image of the tale and a symbol of the good is the White Cat owning a mill. The fairy tale opens with a romantic description of well-being and prosperity. "Once upon a time, when the years were good, there was a cat who owned a mill. The mill worked day and night: prrr, prrrup, prrr... (..) The miller himself was walking around in a white coat and counting the sacks of nuts and almonds." Yet, as it usually happens in fairy tales, the goodness prevails again. The sad path of the White Cat eventually crosses that of a King compassionately commiserating all the torment and pain of the world. The Cat can finally share his unhappy life experience with somebody who is a good listener and has a kind heart. The King is ready to use his powers and severely punish all wrongdoers, yet the Cat finds forgiveness in his heart for all of them. "My King, I bear no grudge against them. These little children are so curious. They don't know hurt yet. They want to see pain and rejoice to see the cat suffering. Life will soon injure their young souls and they will learn. Maybe we shall even become good friends." 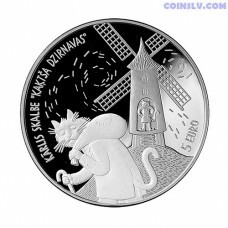 "Cat's Mill" is one of the nine fairy tales of the "Winter Tales" collection by Kārlis Skalbe. Part of them were written while he was in prison. At present, the whole collection has been included in the Latvian Cultural Canon. "And so it was. The Cat got back his mill. The devils snatched the Black Cat with his money chest and whisked him away to the swamp as they no longer felt safe to live at the mill. And the Cat stood again in front of the mill in his white coat. And the nut grinders and almond grinders were purring again..."